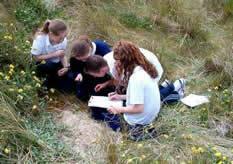 Since September 2010 the Wexford Wildfowl Reserve has been part of the Discover Primary Science and Maths Network. If your school is part of this programme, please inform us of this when making a booking. The Snipe Field is an outdoor education area close to the visitor centre with a site ideal for pond dipping, looking for and observing insects, identifying butterflies and looking at habitats. A boardwalk will lead us back to the centre where you can look at the exhibits or eat your packed lunch outside in the picnic area. This activity takes place in the Raven Nature Reserve close to Curracloe. With ample open areas for pond dipping and bug catching, there is also the opportunity to have a closer look at the trees in the wood or a walk down to look at life in the dunes and a walk on the beach to talk about the ocean and how we can help keep it clean and healthy for everything that lives there. (Note: the nearest toilet facilities are in the Curracloe beach car park). The duration of both of these programmes is approximately 2.5 to 3 hours (usually from 10am to 1pm but times can be flexible). The outdoor activities are most suited for 1st to 6th class students. The winter schedule is mostly indoor based as appropriate for this time of year. Our Greenland White-fronted Goose workshop is suitable for younger classes and concentrates on learning about the birds through quizzes and observation. Our Wild Science programme is suitable for older age groups, 4th, 5th and 6th classes. This session involves a greater study of bird life. Workshops can be adapted to suit different age ranges and abilities. All of our winter programmes are 2 to 3 hours long (usually 10am to 1pm).